With the Olympic and summer takeover of Victoria Park already underway (the hoardings, stage and tents for next weekend’s Field Day are up; see the list of events June, July and August here), it’s worth asking the question of whether the council can cope. I went for a run in the park at about 11am on Sunday. 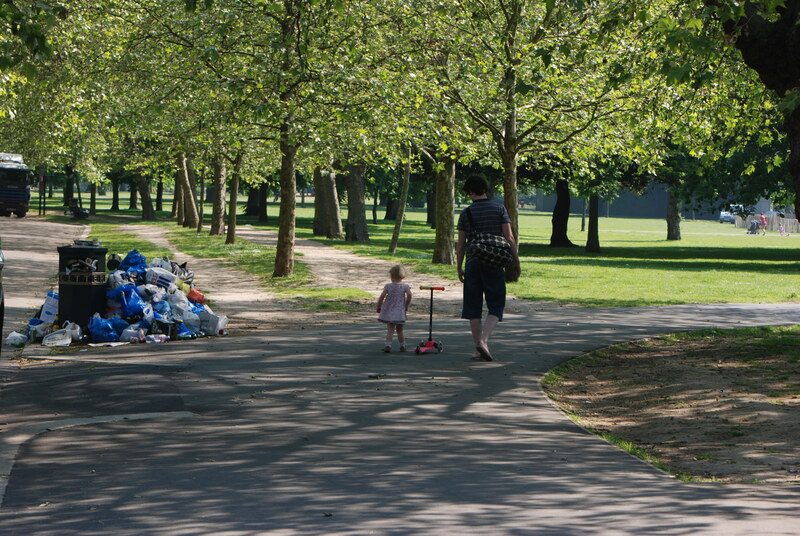 Many families were also there, looking for a space among the litter and debris for somewhere to sit. Plastic cups, crisp packets, empty bottles of spirits and cider and cans of lager simply left where Saturday’s visitors/vandals had left them. A bit further along on my run, I spotted two park rangers with a mini-garbage collection van. I think it was too hot for them. One was leaning against the van, playing on his mobile while the other chatted to a mate on his phone. To be fair to them, they didn’t leave the mess (and it really is the visitors who are at fault) but I couldn’t understand why at 11am the litter was still there. As soon as Whitechapel and Bethnal Green markets finish for the day, a whole fleet of bin workers move in: the operation is genuinely impressive and effective. Why can’t that happen in Victoria Park? And when there is hot weather, why can’t Tower Hamlets Council place large temporary bins in the park? The smaller bins simply can’t cope with the entirely predictable increase in visitors during warmer weekends. The extra picnic tables they’ve installed are great, but picnics leave litter–and there’s nowhere to put it. If we’re not careful, our fabulous East End park will begin to resemble north London’s loathsome Finsbury Park. If Tower Hamlets can’t cope, maybe they should hand back control to Hackney council and its Mayor Jules Pipe. I’ll leave this thread open for your suggestions for Mayor Lutfur Rahman. In the meantime, here’s some photos I took this morning at 10am (the rangers seemed to have started work much earlier today; maybe they’re under pressure to save overtime at weekends).